Healthy veins carry blood from the extremities back to the heart, where it becomes oxygenated, and then circulates throughout the body again. Sometimes, vein walls and valves become weak, and that allows blood to flow backward or pool in the vein, which causes the telltale twisted, blue veins known as varicose veins. Many people may think that varicose veins are just a cosmetic concern, but that’s a big misconception. In fact, most cases of varicose veins are caused by a condition known as venous insufficiency, which can lead to more serious problems if not treated. For many patients, the most effective varicose vein treatment will be a minimally invasive procedure like sclerotherapy, ablation or phlebectomy. However, insurance companies often require patients to try more conservative varicose vein treatment options first, before other procedures will be covered. Compression stockings – Compression stockings provide support to the leg and help to promote proper blood circulation. Elevating legs – The pull of gravity can make it harder for leg veins to pump blood upward. Elevating the legs helps blood flow more easily in the right direction and may help alleviate some swelling. Oral anti-inflammatory medication – Inflammation makes the pain of varicose veins even worse. Oral anti-inflammatory medication, like Ibuprofen or Aleve, can help to reduce inflammation and pain. Weight loss – Added weight puts added pressure on veins. Losing weight can help to decrease pressure on veins and provide some relief from varicose vein symptoms like pain and swelling. Exercise – Regular exercise has many benefits, one of which is improved circulation. Even something as simple as a brisk walk 30 minutes a day can help to boost mood, circulation, and prevent heart disease. 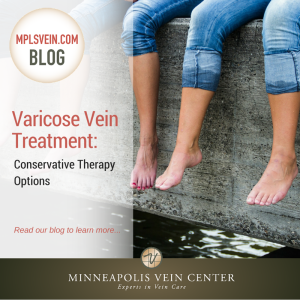 The Minneapolis Vein Center offers a full line of varicose vein treatments to fit the unique needs of many different patients. Schedule your varicose vein consultation to learn more about your specific diagnosis and which varicose vein treatment would be right for you. Call today at 763-398-8710.